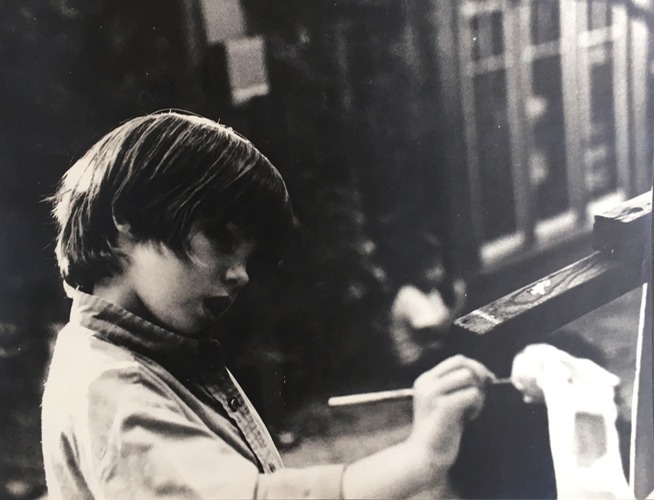 As I started to write this blog, I was thinking about all the different forms of art I have engaged in throughout my life and was about to start with that, as though that was really something special. And then I realized that considering all the many forms of art that exist, I have really only participated in a small fraction of them. Indeed, it seems there are new art forms being invented every day. For each of us, however, the whole of our creative experiences is unique. No matter how varied or limited, there's always a lot of interesting stuff from the past, if one takes the time to look back. Thus I decided to dig up a few things from my artsy past to see what that reveals. I have always been enamored of horses, so you'll see some here. I am painting a (paper mache?) horse in this very old photo. I made the horse using toilet paper tubes and I forget what else. I'm sorry no one got a picture of the horse, but I remember it. I think I was six years old. Below are more horses and our cat, Rosemary. I was maybe seven or eight years old. I actually signed the drawing of Rosemary, hastily, just initials. I'm sure some adult told me I should sign it. 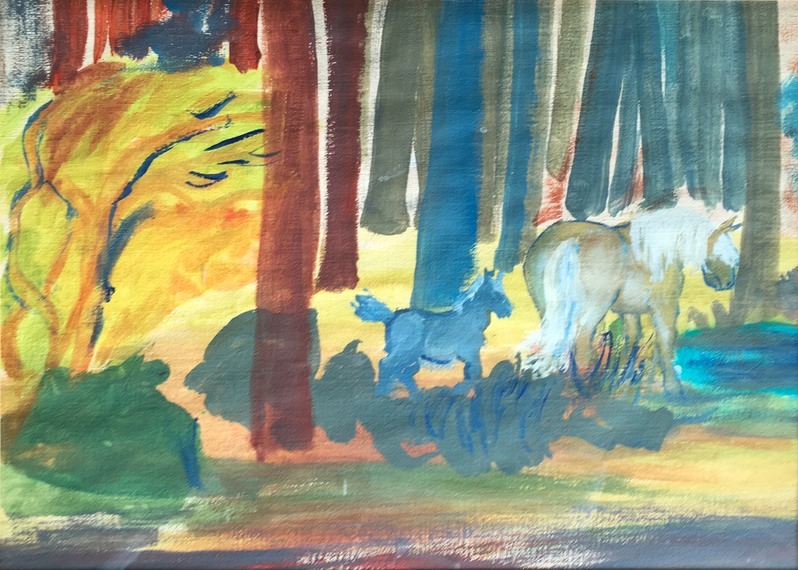 My mom framed this acrylic painting I did of horses in a forest. I found the painting in a box in my parents garage some decades later. I don't think it was finished. When I was a child, most of my art, finished or not, ended up in one of the many giant heaps of stuff I had in my horrendously messy room. Eventually, inevitably, the stuff in those heaps got mangled or worse. I think my mom wanted to rescue at least something. Here is a batik and some kind of painting where you scrape off a top layer of paint (can't recall exactly). I made these in my art classes when I was ten years old or thereabouts. The batik was meant to be hung in a window. I taped it to my studio window for this photo. Very 60's. I really got into drawing in high school. I was also into 'The Lord of the Rings'. I used to bring the book with me deep into the forest and read it sitting on the ground, leaning against a tree. I am currently reading, 'The Hidden Life of Trees', by Peter Wohlleben. I knew it! So fascinating! 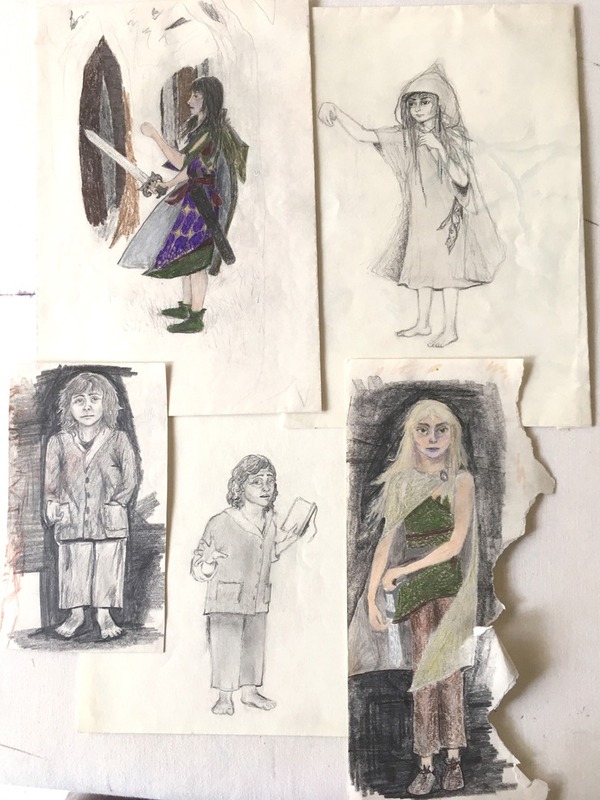 Here are some drawings I made of various characters from, 'The Lord of the Rings'. All from my imagination, and with the help of J.R.R. Tolkien's exquisite writing. There had been no movies made yet, not that I knew of. I don't know who the two characters at the top were suppose to be, but the two at the bottom are probably obvious to any Tolkien fan - Bilbo (or Frodo?) and Legolas. And dragons ... another Tolkien influence. I started embroidering in college. Not that I took any classes in it. Some friends taught me. 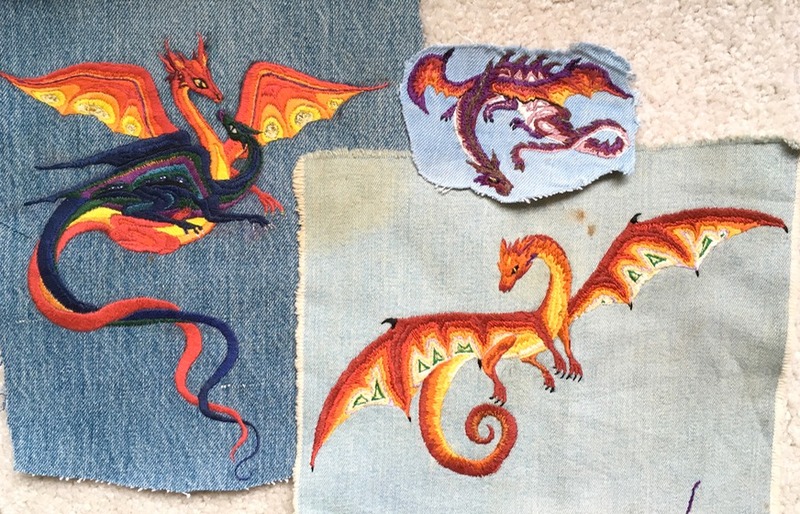 I embroidered many things but dragons were my specialty. Truth be told, Tolkien's influence has been with me my whole life. In my early 20's, with the help and influence of my father, I became an avid photographer. Again, it wasn't a profession (meaning I didn't sell anything) but I did win a number of awards. I have yet to unearth what I have left of my old photos and many of them are on slides. I'll need to figure out how to get them into the computer. So, come back for the next post as I continue our journey into my creative past! 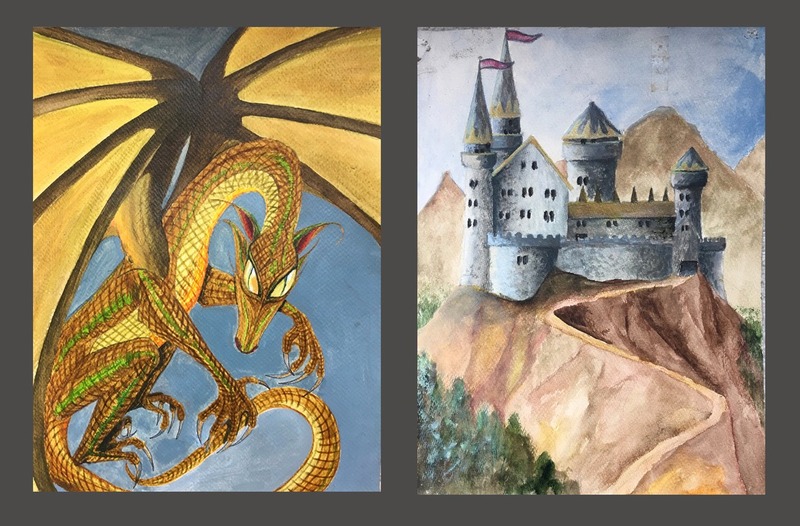 To view my current artwork, please click here.